Saucony’s marketing pitch: Continuous cushioning and a superior lightweight fit. Upper: Engineered mesh, inner sleeve, Pro-lock strap based lacing. Midsole: Full-length EVA foam with an Everun topsole. 4 mm heel to toe offset. Outsole: Rubber pieces placed selectively under the heel and forefoot. 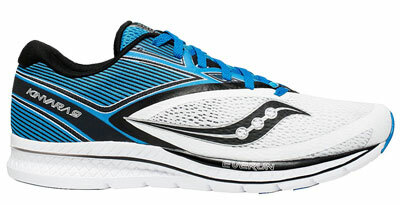 Saucony’s popular lightweight neutral trainer turns a bit firmer and frees up some toe-box space. It still remains a great choice for a variety of runs. In many ways, the Kinvara’s evolution mirrors that of the New Balance Zante. The series began its life with a set of desirable characteristics which made it extremely popular. Then slowly but surely, the shoe changed. Like a minor increase or decrease in midsole softness. Or a slight tweaking of the upper fit. And before you know it, the shoe is far removed from the original version. Not all changes are bad. On the contrary, advancements in footwear materials and foam compounds often lead to an increase in comfort and durability. In the process, a shoe will lose some customers and gain new ones. The point being – it is unreasonable to expect a running shoe not to change over the years. Admittedly, some running shoe types (like racing flats) have a much longer lifespan, but the bread-and-butter models will change every year with all the punctuality of a Japanese commuter train. The present-day Kinvara 9 is a very different shoe than the versions 1-4. In fact, the version 5 was the turning point for the franchise. The ride got noticeably softer, and the upper lost its minimal fit and feel. And in what was a totally unnecessary move, the ‘pro-lock’ strap was added to the Kinvara 5’s lacing system. Since then, the pair of midfoot straps has been a part of the Kinvara’s feature set. The V9 gets Pro-lock too, except that they are thinner and stretchier. While the K9 has a similar midsole set-up (Everun+EVA foam) as the 8, the ride is firmer due to a few design tweaks. So if you got on the Kinvara train late (post V5) and liked the softer ride of the K8, then it is perhaps best that you stick to the 8. On the other hand, if a faster Kinvara is what you like, then read on. Think of a lightweight trainer with a 4 mm heel-to-toe drop, and a mental image of the Kinvara is likely to pop up. This shoe has long been the standard bearer for this category, though it’s had its share of ups and down. 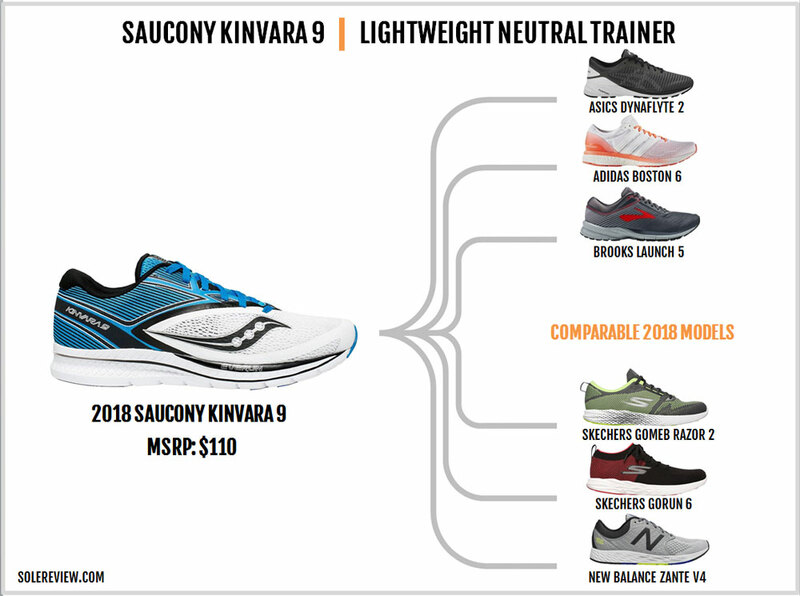 The Kinvara 9 picks up where the 8 left off. The EVA foam midsole retains the 23 mm heel and 19 mm forefoot thickness, and additional cushioning is provided by the Everun Topsole (glued to the lasting, see image below) and a removable EVA foam sockliner. Most of the midsole is EVA foam, and Everun exists only as a small component. Nonetheless, it adds a small degree of responsive or springback feel. Interestingly, the Everun’s responsiveness is more noticeable here than in more cushioned trainers such as the Ride and the Zealot. Based on our experience with Everun fitted Saucony running shoes, the ‘Topsole’ works best over firmer midsoles. The Guide is a great example of this, and so is the Kinvara. 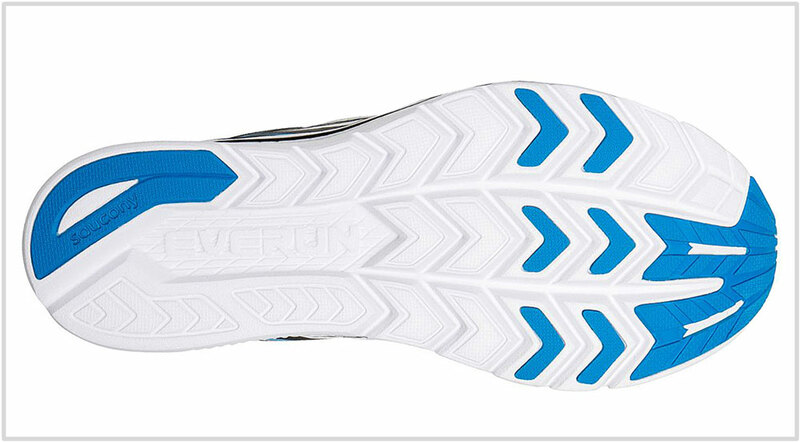 When paired with a firmer midsole, the Everun Topsole is the first to compress during runs. This factor isolates and accentuates its responsiveness. On the other hand, the topsole gets lost in softer shoes like the Ride and the Triumph. 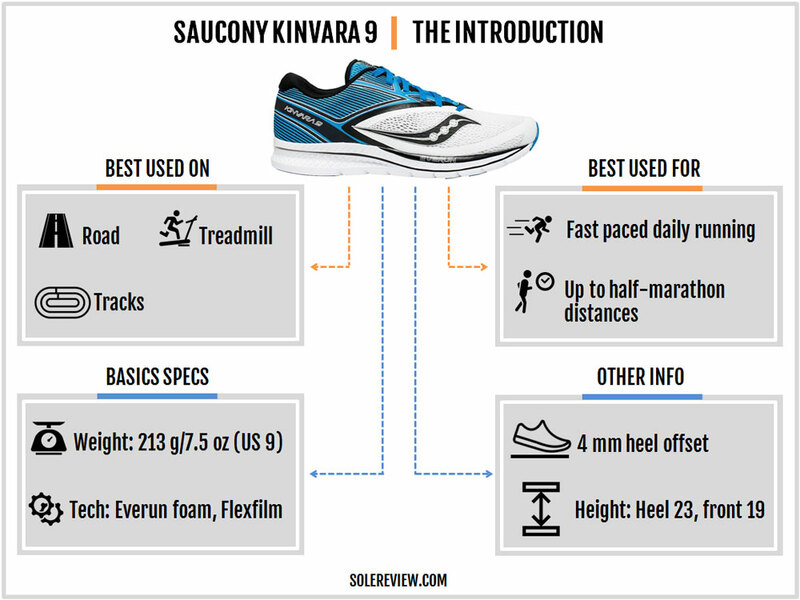 The Kinvara 9 is slightly firmer than the 8. If you turn the shoe over, the reasons become apparent; the Kinvara 9 has a brand new outsole geometry. The new outsole removes the rubber lugs placed over the midfoot foam pods. The forefoot lugs are consolidated into fewer rows and the heel crash pad loses the groove on the edge. The transition cavity under the rearfoot is also shorter than the 8. The reduction in grooving under the heel and the midfoot makes the ride quality firmer and flatter. In our opinion, this kind of cushioning is just right for the Kinvara. Forefoot transitions feel faster due to the rearranged and reduced number of lugs in the center. The outer forefoot now has a set of rubber lugs (not present on the K8). The K9 shaves off 0.4 ounces/9 grams due to this change. Flexibility is slightly better because of the deeper forefoot grooves. 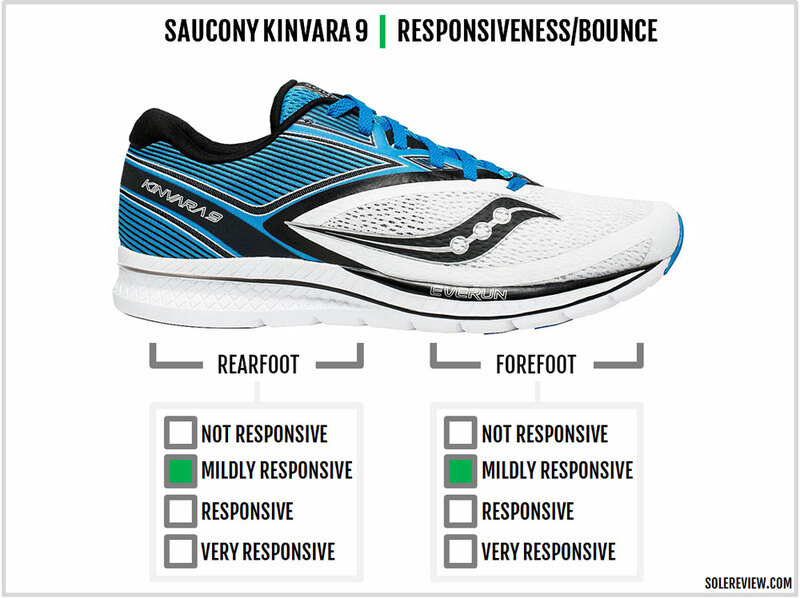 Apart from that, the Kinvara maintains its supportive and very neutral ride character. The forefoot has a wide flare and this translates into a planted ride quality in the front. And like the Kinvara 8, the 9 requires a break-in period. This is needed because the midsole stack has multiple layers and densities. The K9’s rear midsole appears thinner than 8. However, both the 8 and the 9 have an identical 23mm rear and a 19mm forefoot. If the Kinvara 9 appears slimmer, that’s because of the lower sidewall edges rather than the actual thickness. The 23 mm and 19 mm stack means that the Kinvara has plenty of underfoot cushioning. This makes the shoe suitable for longer (10 mile+) runs. There are two things you need to know, though. The K9 happens to be slightly firmer than the 8 due to the changes mentioned earlier. This reduces the ride comfort/softness over last year. So you’re better off running in the 8 if you desire cushioning softness. Secondly, if you are absolutely new to the Kinvara series and are transitioning from a much higher drop shoe (say, like the 12 mm drop Brooks Ghost), then you might experience a temporary Achilles soreness. We recommend that you ease into the transition with shorter runs before embarking on 10 mile+ running adventures. Regardless, we’d limit the use of the Kinvara to a half-marathon. A more cushioned shoe (see our rotation section) will be easier on the feet for marathons and longer distances. The Kinvara also does an excellent job of managing higher speeds (7min/mile or 5min/km or faster) workouts. The non-sink cushioning quality, when combined with factors like the flat and firm-ish ride, make the transitions smooth and efficient. Also, the Kinvara performs well as a treadmill or track trainer. That said, you’ll never get back the feel of the original Powergrid-based Kinvaras but the V9 is as close as you can get. The Kinvara 9 remains very versatile; it’s good for long and easy runs, faster training, and everything in between. 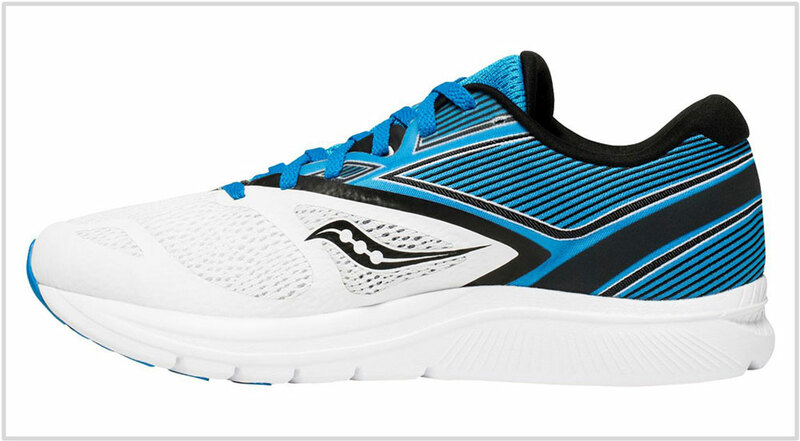 From the outside, the Kinvara 9’s upper has little in common with the 8. The exteriors are a throwback to the older Kinvaras; as a matter of fact, the V9 looks very similar to the 4. Unlike the large-pored mesh of the V8, the Kinvara 9 uses a soft spacer mesh with thin Flexfilm layers forming the toe-box and the forefoot. There’s also reduced layering on the side and the top as compared to the 8. 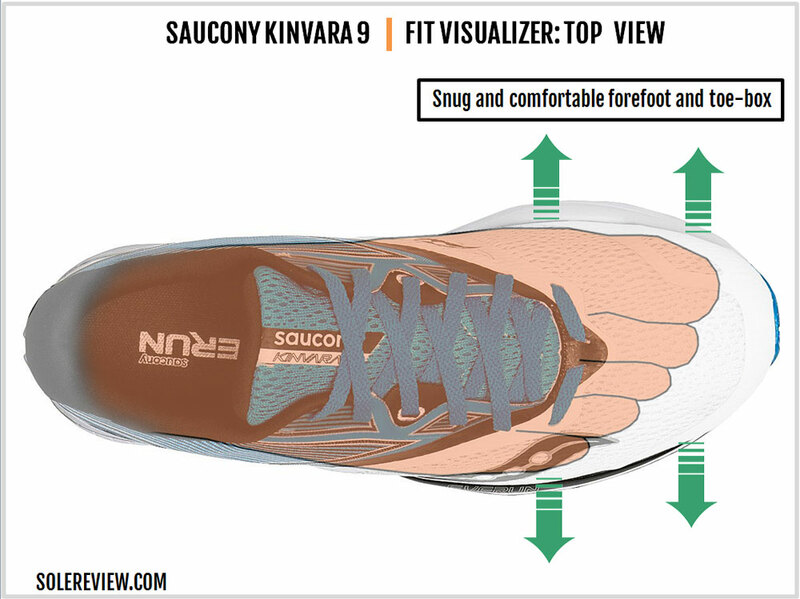 The Kinvara 9 has an upper fit which is form-fitting. That said, the toe-box and forefoot feel noticeably less cramped than the 8. The new mesh is more accommodating, and relocating the Saucony logo away from the toe-box frees up some room. These updates help the 9 achieve a true-to-size fit character. The midfoot has a smooth and secure fit. There’s a thin sleeve attaching the tongue to the base of the upper which prevents tongue slide. Between the sleeve and the outer upper are a pair of ‘Pro-lock’ straps. We’ve been vocal critics of the Prolock straps. Sure, this feature might work for built-up support shoes, but the Kinvara isn’t one. In fact, one of the reasons why the early versions which made the Kinvara popular were successful because they featured a no-frills upper sans the Prolock. So when the Kinvara 4 evolved into the 5 (which lay the foundation for the next generation Kinvaras), we voiced our displeasure at the Prolock midfoot. To be clear, Prolock does not produce any discomfort. It’s just that they are gratuitous on an upper which targets a lightweight and minimal construction. 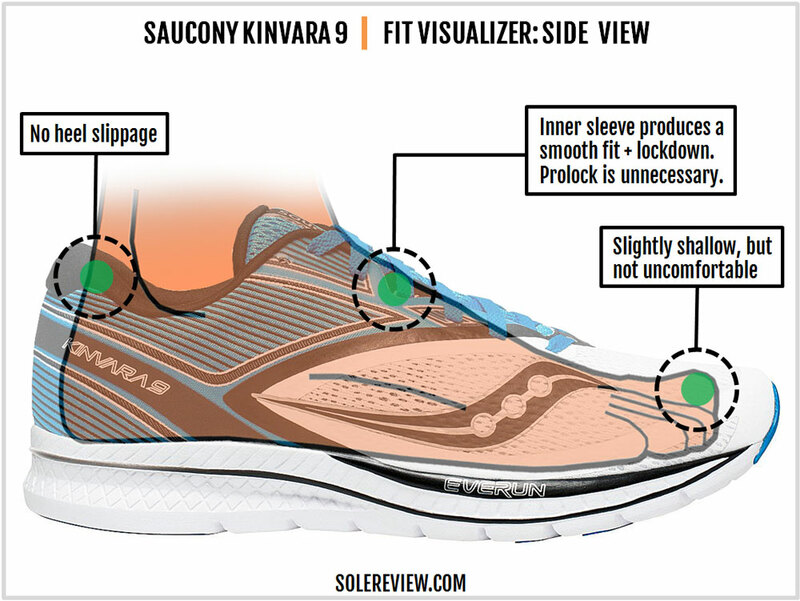 If it’s any consolation, the Kinvara 9’s Prolock straps are thinner and stretchier. This change makes the straps more comfortable. The Kinvara 9 has a slightly longer tongue than the 8 which is good for insulating the top-down pressure from the heel-lock lacing. The tongue isn’t as plump as the 8 and yet feels smooth and padded over the foot. The label on the top is reflective for low-light running, and so is the thin strip over the heel center. The heel gets a cosmetic upgrade and a minor functional redesign. The Kinvara’s outer heel uses a woven fabric and a rubberized band which gives it aesthetic depth. The soft heel lining turns over the Achilles dip like the K8 but covers a larger area. This tweak makes the Achilles dip a bit softer than 8. The padding behind the lining isn’t a lot but there’s no heel slippage. The heel uses a small internal stiffener so the back isn’t 100% collapsible. 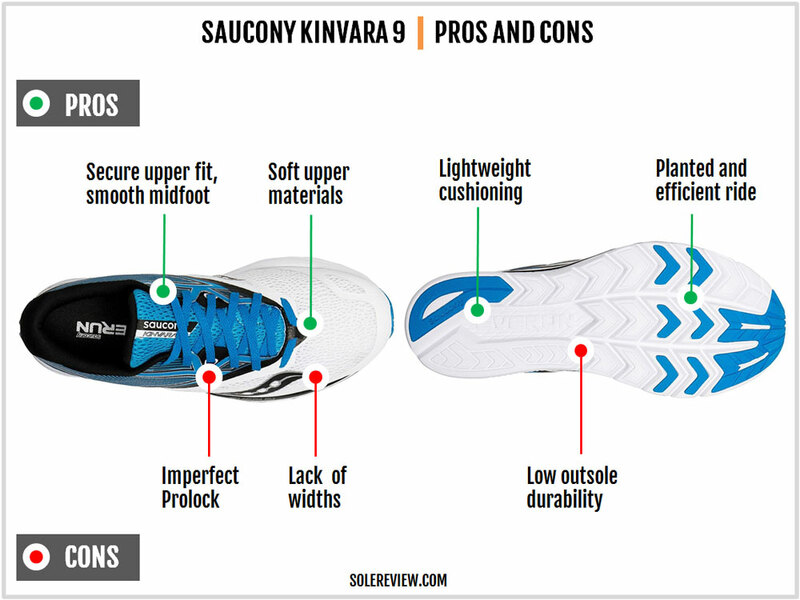 Over the years, Saucony has maintained the Kinvara’s basic outsole layout. Most of the outsole is EVA foam with selective rubber covered zones. On the Kinvara 9, parts of the forefoot have boomerang-shaped lugs inlaid into the foam pods. 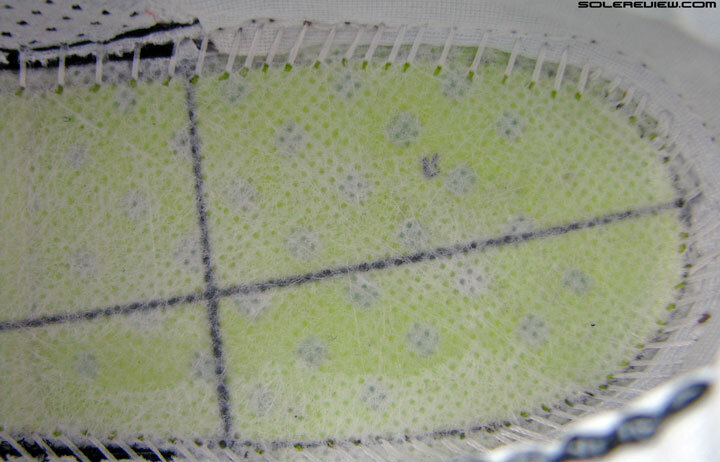 The heel crash pad has rubber cladding too, except that the Kinvara 9 has removed the rubber coverage under the outer midfoot. Thus, most of the traction duties are performed by the EVA foam midsole, with wear and tear occurring sooner than traditional rubber-shod trainers. 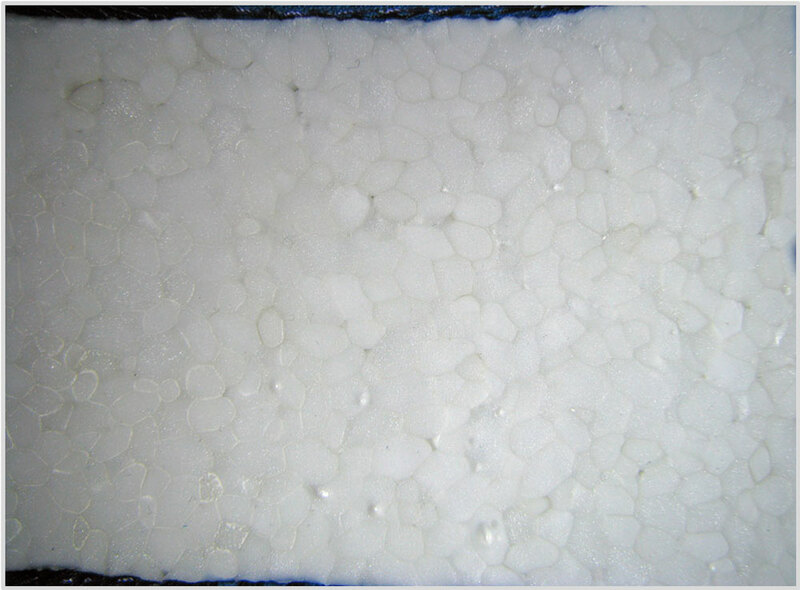 The midsole and insole are also EVA foam based, so a gradual loss of cushioning will take place. 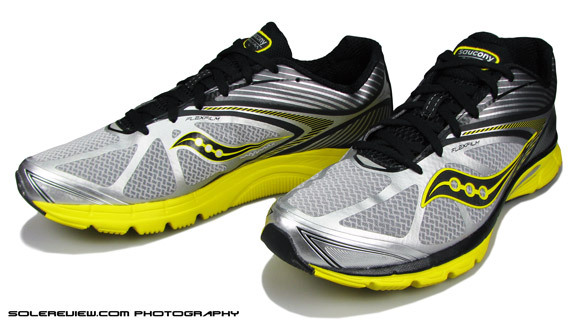 The Saucony Kinvara 9 has a versatile ride quality. It’s lightweight, cushioned, and mildly responsive which makes the shoe suitable for a wide variety of workouts. The wide forefoot flare and redesigned outsole results in a planted ride with connected transitions. The sleeved upper has a snug yet comfortable feel. That said, the upper could do with the imperfect ‘Pro-lock’ straps. The Kinvara has shied away from offering widths so if you happen to have ultra-wide feet, this works against you. 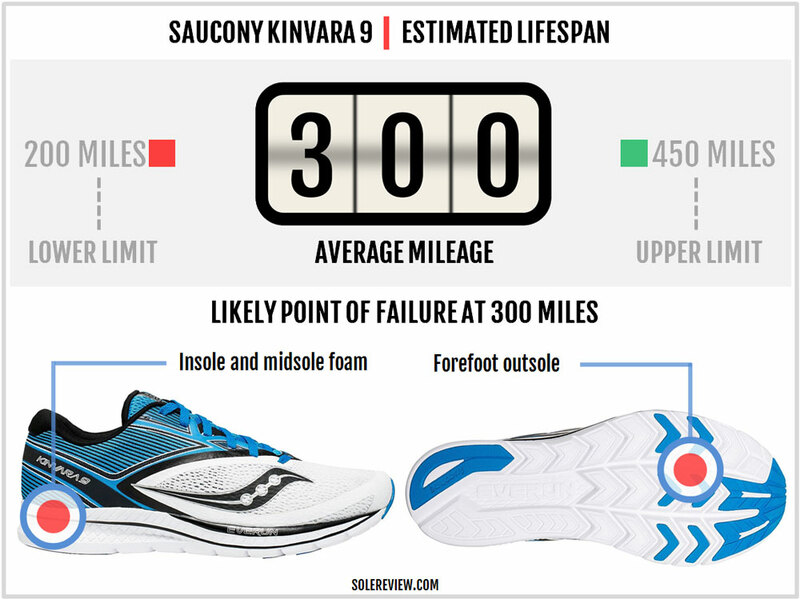 And lastly, outsole durability has never been one of Kinvara’s stronger points. Given the decrease in rubber (over the K8) and the mostly-foam outsole, the Kinvara 9 tends to show its age earlier than regular trainers. 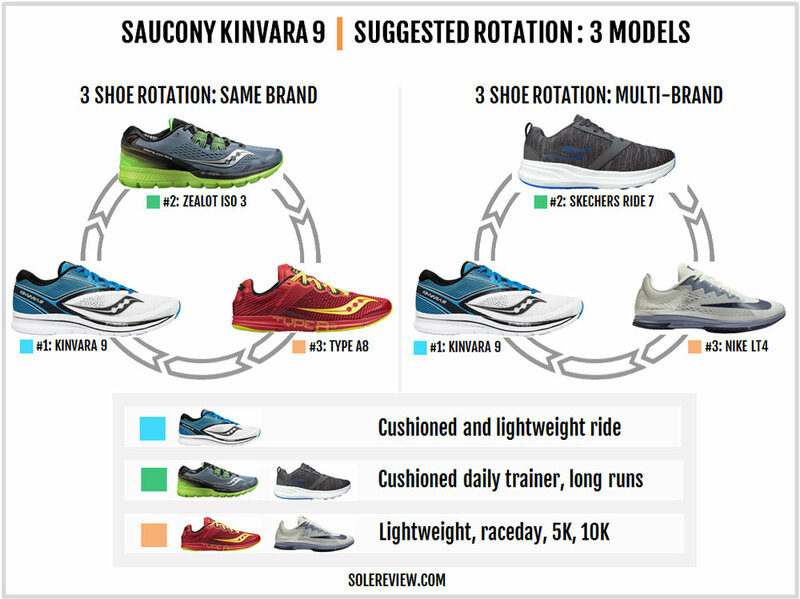 There are a couple of things you could do when choosing a rotational companion for the Kinvara 9. You could either stay in the vicinity of the 4 mm drop midsole or make it a bit diverse in terms of heel offset. If you want to stay in the lower heel drop territory, the Saucony Zealot ISO 3 is perfect as a (more) cushioned companion to the V9. The midsole is thicker, plusher, and yet maintains the same heel to toe gradient. Its upper has a comfort fit with a dual-pair of internal support bands. Else, the Saucony Ride ISO and the Triumph ISO 4 are other cushioned alternatives, albeit with a higher heel offset of 8 mm. The Triumph has a full-length Everun midsole and topsole whereas the Ride ISO uses an Everun+EVA foam configuration like the Kinvara. Tossing the Kinvara 9 together with the Skechers GoRun Ride 7 is also an excellent idea. The Ride 7 has a low heel drop with plenty of resilient midsole cushioning for longer runs. For races and such, the Saucony Type A8 or the Nike Zoom Streak LT 4 are your options in a low drop and hyper lightweight package. There’s a wide range of other lightweight trainers available. The Asics Dynaflyte 2 has a firm ride, a snug upper, and a generous outsole rubber coverage. The Brooks Launch 5 has a thick midsole and yet firm and lightweight enough for fast runs. The Launch has very comfortable upper interiors too. If not the Kinvara, then consider the New Balance Fresh Foam Zante V4. Its lightweight and cushioned ride make it versatile for different kinds of runs, ranging from short, fast runs to a half-marathon. Both the Launch and the Zante are shod with full-length rubber outsoles which gives them a durability edge over Saucony. The Skechers twin of the GoMeb Razor 2 and GoRun 6 are lightweight trainers which offer a low drop midsole with a firm ride. Both these shoes ride very similar but have very different uppers. The Razor has a traditional laced-up design whereas the Ride 6 has a sock-like knit upper. The adidas Boston 6 is the most expensive of this lot. But if you’re looking for a cushioned and responsive ride with an ultra-durable outsole, the Boston 6 is the go-to shoe. The updated adizero Boston 7 is currently available in a limited color edition but a widespread release is still several weeks away.